A Quiet Place, directed by and starring John Krasinski, premiered in theaters April 06, 2018. The film focuses on a family trapped in an apocalypse scenario in which monsters with extremely powerful hearing have descended upon Earth. To survive, the family must go about its day to day lives in perfect silence. One wrong step on a stray branch or leaf will cause the monsters — and certain death — to quickly follow. This scenario of total silence is the main tool in which the film builds tension as the narrative progresses, and the attention to detail involved in making it believable is wonderful. The film begins about 80 days after the monsters arrive, and it quickly becomes clear that the family has survived so long because one of the children is deaf, and thus every member is fluent in sign language. Wherever the family goes, Krasinski’s character pours sand in front of them to silently step on, the family is barefoot at all times, and floorboards which don’t creak when stepped on have been painted white in the family home. These details lead to an immersive experience while watching, and because the film is almost always silent, moments where sound is made are extremely anxiety inducing. As the film progresses hundreds of days pass and we learn that the wife of Krasinski’s character, played by Emily Blunt, is pregnant, obviously a serious obstacle in a world without medical care where making noise is equal to death. The pregnancy becomes the focal point of the film, as Blunt’s character’s water breaks while Krasinski and his son are away from the home and the families deaf daughter has run away. Blunt is left to fend for herself while desperately trying to grimace through contractions in some of the film’s most captivating and frightening scenes. Both Millicent Simmonds and Noah Jupe offer strong performances in tough roles as Krasinski’s silent children; their fear and determination translate well on screen, and Krasinski and Blunt offer excellent performances to round out the cast, although watching Krasinski act out a character who’s life doesn’t revolve around paper is always a bit jarring at first. 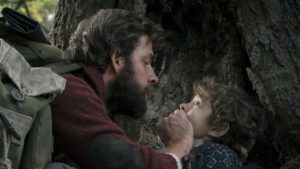 The film manages to be very tense and terrifying without leaning too much on jump scares or excessive gore, which is refreshing to see in a genre so diluted by mediocre blood baths and ghost stories, and as mentioned previously, the attention to detail as far as world building is concerned is one of A Quiet Place’s best strengths. Additionally the film handles the character of Millicent Simmond’s deafness very well. Although she is the reason the family is able to sign, her deafness poses a serious obstacle in that she can’t hear any noise that are being made around her or that she herself is making. This obstacle plays into one of A Quiet Place’s best scenes, in which a noise is made behind Simmonds and we watch through her eyes as her family reacts and she is oblivious, this scene and others in which the camera shows us the world through her eyes are intensified by a total silence that accompanies them, we hear as little as she does, throwing our perspective into one of intense disorientation and tension. While A Quiet Place is mostly a world full of fear, the family finds brief respite in a few happier scenes, which help with pace and relaxation between tense moments. One scene in particular, in which Krasinski and and Jupe let loose loud yelps underneath a waterfall, which masks their voices from the hearing of the monsters, is particularly charming. The film suffers a few pitfalls, which mostly involve setpieces meant to force encounters between the main characters and the monsters which feel almost too inconvenient to be believable. A door on top of a grain silo gives way without warning, a pipe bursts unprovoked, and a man appears out of nowhere in the forest, only to let rip a huge scream because his wife has just died. The film feels much better during more organic moments like Blunt’s pregnancy, and the youngest child activating a noise making toy space ship because he simply isn’t old enough to comprehend the situation he’s in. That being said, A Quiet Place is constantly engaging and a blast to watch, the genre as a whole can learn a lot from the things Krasinski and co. are doing here. Rather than relying on tried and true horror tropes, A Quiet Place zeros in on a single fresh idea that doesn’t need to be pumped full of constant action to stay entertaining and scary. Instead, A Quiet Place’s tense, slow burn is quite a treat. Senior Jesika Islam is the Arts & Leisure Editor. Her email is jislam@fandm.edu.